Looking out the kitchen nook window by the table. Such fun to eat at the table each day with this view. READING: C. S. Lewis' Screwtape Letters -- Matt is reading it for Theology and while I have read a lot of CSL, I have not read this one. It is rather funny...an older devil giving advice to his nephew on the best ways to convert humans to devilish ways...funny. (Of course, you are supposed to take with you the idea of NOT doing these things.) You might find it interesting to note that C.S. Lewis, Aldous Huxley, and President John F. Kennedy all died on the same day, same year, within hours of each other...Nov. 22, 1963. COOKING THROUGH: Ina Garten's Barefoot Contessa at Home -- always good workable recipes and we have never found one we didn't like. FAV NEW FIND: Green velcro tape fasteners for putting up garland greenery on the stairway rails for Christmas decor...very fast, very easy, and reusable! FAV THING TODAY: Today is still young, but so far today, my favorite thing has been laughing at Alex this morning. He overslept and came into the kitchen at a dead run saying, "Out of my way, out of my way, I think I can just make the bus." In his hands were his shirt, coat, socks, shoes, and book bag. He LEFT THE BUILDING in that attire, trying to get it all on as he ran to the bus stop, just narrowly jumping on as it was beginning to pull away. Thoughts of Dagwood Bumstead, minus the collision with the mailman. BTW, it was 26 degrees outside...am sure the socks and shoes were the first to be donned. SCRAPBOOK PAGES THIS WEEK; Several...forgot to count but I had to put it all away for the holidays, so I finished up several pages to get that in order until January as I don't usually work on it in December with everything else going on. GOING TO: Finish decorating the house and outside trees/bushes for the holidays; swimming; choir; first of the holiday Christmas parties; scout camping; Lifeteen; whatever else comes around. 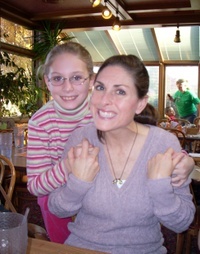 PRAYING FOR: Carolyn as she is dealing with all the "after" of cancer surgery and suffering greatly. Also, for her family: husband Paul; children Lydia, Frances, and Charles as they struggle to help her emotionally and physically. For all cancer patients everywhere, please join me. 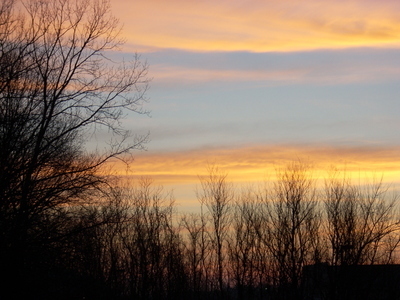 The view on the backyard deck this morning as I returned home from the Guerin run. Absolutely gorgeous...this doesn't even do it justice. Be still my heart! It's been a busy week so far with volunteering and cooking for others who need a little extra lovin' this week. I can't see that I have gotten all that much else accomplished, other than taking care of my family. Actually, that's pretty much how I like my life to go, so things are fine by me this way. The guys carried down all the holiday seasonal boxes of decor from the attic and we are in various stages of distributing those about, doing a little each day. Matt particularly likes getting things all set up light-wise, has the front door area all decorated, as well as the garland and lights on the stairway rails, and the three trees all have lights, the one in the family room being the only one completely decorated for now, complements of Matt, Alex, and Mark. I like to have the house all decorated before December when the extra commitments of holiday choir gigs and swimming meets kick in and we are busy every weekend with those things. It is just more relaxing this way. Besides, who am I kidding, I love the holiday decor and cinnamon/peppermint/cranberry candles burning around here during the holidays. A fire at night to read by, the trees lit, hot apple cider in mugs to sip as you read...come on, what's not to love about all that? Have a good morning...go out and make the day good for someone else for no good reason at all. And, most of all, keep counting your blessings! 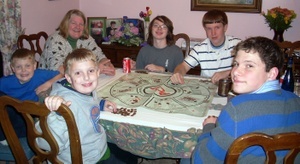 Aunt Nan, Alex, David, Matthew, Jonathan, and Steven engaging in a traditional after-Thanksgiving dinner activity: Poker. Grandma and Grandpa's dining room hosts many such activities at every gathering. Well, it's been a good long time since I have posted anything here, being busy with Blue Bernice and holiday gatherings and all. We had a great Thanksgiving holiday...how about all of you? We saw lots of relatives, feasted on lots of Thanksgiving fare, and made lots of good memories. There were movies, bowling games, card and game playing, and even a trip out to a local restaurant en masse. A good time was had by all. However, I did finally see the movie Ratatouille...remember how I whined related that no one would go see it with me? Well, coincidentally, Shelley and I both saw it separately this weekend and we are both thinking our time would have been better spent elsewhere. (You can read Shelley's review of it on her blog Insomnimom linked at the left side bar of this page.) I really was not expecting the characters to be quite so "Rat-like." Mark said, "Well, what did you think they would be?" I really didn't know, but I didn't think they would be so Rat-like. I thought they would be cute somehow. They weren't. Not at all. When they were being chased, I turned to Mark and the boys and said, "Do you think it is horribly wrong of me to want them all dead?" They just laughed. Wrong, very very wrong of me...but I really did wish they would all be caught, exterminated, and that would be the end of the movie. My skin is still crawling at the thought of Remy in Linguini's hair...OMW! So it was that I finally got to see the movie after all that time of whining waiting to see it...and all it did was remind me of that old saying, "Be careful what you wish, or you will surely get it." I definitely need to stick with movies like The Illusionist, now there's a great movie. Am headed out today for volunteering at Guerin and looking forward to MNO this evening to catch up with everyone's holiday news. It is spitting snow as we speak...I am so not ready for winter. 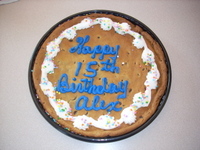 Happy 15th Birthday, Alexander, on November 17, 2007! Was there really a weekend? It flew by so fast, I can hardly register that it has come and gone already. Let's see, the Hoos beat the Boilermakers in the last few seconds of the Oaken Bucket game, not exactly pretty as they lost a huge lead necessitating the win in the final moments, but pretty or not, the Hoos get to take the bucket back to Hooville for the coming year and possess said bragging rights that accompany that little deal. The Colts, in what had to be one of the lowest scoring games ever, did win. The football Hawks lost...and probably there goes their bid for any sort of bowl as I am thinking 6/6 probably won't cut it. And, now for more important matters, we had a great double feature this afternoon with the Hoos winning on the court, followed by the Hawks doing likewise, Todd doing a fine job with those baby Hawks and Freeman still out injured. Alex returned home from his scouting outing in fine form, a few scrapes, scratches, and bruises as scout outings tend to produce such things, and ready to celebrate his 15th birthday, a day late, but the day is not as important as the actual celebration of it. Dinner out at Red Lobster, his choice, was followed by the traditional gift opening of a much desired new guitar, and cake eating. Tanja had taken Alex out to Joe's Crab Shack last week to celebrate, but I did not get a photo as I wasn't here when she picked him up or brought him home, so will need to get one of those soon for the scrapbook. 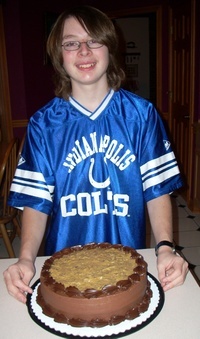 Alex gets to celebrate his birthday for about a week or two because it falls so close to Thanksgiving and it tends to get tossed in with family gatherings, etc....he will have one more birthday bit up in Elwood, and then I think we can call it good for another year. These years certainly have a way of passing quickly. 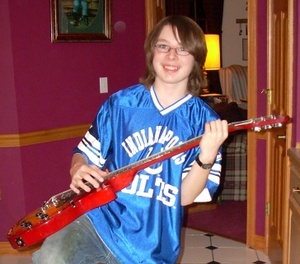 This is what 15 looks like around here with Alex...aka The Cool Dude. Happy Birthday, Alex! 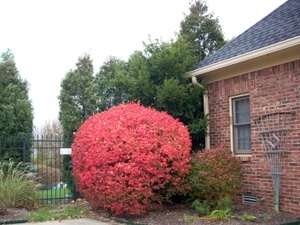 A lovely bright red bush at the end of the driveway greeting me each day as I pull into the garage, all my other little plants there gone for the year...soon it will be time to string twinkle lights on the fence for Christmas cheer. READING: Okay, you can all blame Shelley for this: Aldous Huxley's Brave New World (1932)...I know, I know, I said I was finished with Orwellian angst, but Shelley and I were discussing it at Pizza Hut on Tuesday and which choice would have been better for the English assignment: the Orwell, the Huxley, or even, as I suggested, Yevgeny Zamyatin's We, (1921), where it probably all began in the first place since Huxley was Orwell's professor originally, and although he claims he had not read Zamyatin, Orwell clearly read both We and Brave New World before embarking on 1984. At any rate, Shelley and I got to talking about some of the questionable bits of the Orwell and the Huxley in relation to assigning either to high school students, especially 9th graders who barely really even have a concept of Russian politics in 1905 and 1917 and why John Reed's book Ten Days That Shook the World would have been a better place to begin so they could just have some background before going into the others...and why are we reading these in literature class instead of history class anyway? Okay...enough, you know I could go on and on about this and I will just leave it to say that I think it will be interesting for me to be able to read Brave New World and then right after it, be able to go into Huxley's Island and read it as I did not read them in tandem before and I am thinking that would be great as Island was written at the very end of Huxley's life and is sort of a complete turnaround from Brave New World. And, if you know anything about Huxley (and you probably do, even though you don't know it...the rock band The Doors took their name from one of his works...he was well ensconced in the drug culture of America, way back, and then carrying forth until the day he died in an LSD induced exit when he died of cancer in 1963...appeared on the cover of Sgt. Pepper's Lonely Hearts Club Band even though he wad dead several years by then...you might not have read anything by him, but there is plenty out there, and he is fairly well known just because he was an incredible intellectual, wrote profusely, and may be considered one of the foremost writer/thinkers in modern American thought, albeit he was originally British, invading the American colonies in the late 30's and exiting around the time the Beatles invaded the colonies). I could go on and on but I am sure you all stopped reading somewhere up there when I first mentioned Orwell again. Anyway, I am reading the two Huxley books back to back. And, I am blaming Shelley for this...you hear that, Shelley? LISTENING TO: The Doors, of course. COOKING THROUGH: Cookie recipes for the holidays...store in the freezer (if you have teenage boys, it is imperative that you mark the boxes "Chicken Parts" or "Liver" so they will not raid them before the holiday trays are assembled...when they were little, the top two shelves were out of reach, and therefore safe, but these days, there is nothing out of reach, therefore nothing is safe from raging teenage boy appetites). The last batch I made did not even make it to the freezer as they descended upon the kitchen before I could get them packaged and squirreled away under the chicken parts disguise. I am going to need to be much quicker about freezing these things if I hope to have any cookies left to assemble into holiday trays for friends. FAV NEW FIND: Silpat liners for cookie sheets...these are not new, and I have had them for years, but I have to say, they are one of my favorite things...NOTHING sticks to them and you just wipe them clean (do not use soap on them ever). 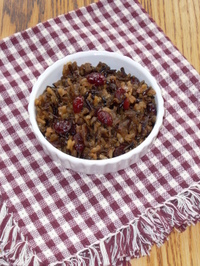 Makes holiday baking a whole lot easier! FAV THING TODAY: I have reached a decision (thanks for shopping with me, Cindy, as your opinion is always key) on the type of camera I am hoping for under the Christmas tree. Actually, I feel a little guilty asking for such a thing, but I am trying to justify it by thinking that most of my photos are of my family and the boys are growing up so quickly that before I know it they will be off on their own and I should take the photos of them and all their activities now while I can. So, really, it is not just something for me alone, right? This is really for the entire family. Anyway...when Mark asks me what they can put under the tree for me...this year I will have an answer...maybe. SCRAPBOOK PAGES THIS WEEK; None...too nice outside yet to want to be inside. GOING TO: Scout weekend camping trip to Mammoth Cave in Kentucky for Alex; Swimming, IYC choir retreat all day Saturday, followed on Sunday by serving Mass, IYC choir rehearsals and Lifeteen for Matt; which leaves Mark and I with a great amount of date time over the weekend...always a nice and happy occurrence. IU plays Sunday at noon, I believe. What's going on there? PRAYING FOR: Safe travel for everyone as we approach the holidays; for the Andersons as Jeff and Aimee travel to his grandmother's funeral; for our neighbors who are feeling a little lonely (as are we) with the demise of Gus, their very old cat who greeted us all every day when we returned home with a wave of his tail and a haughty glance...pets do work themselves into our hearts; for Carolyn and Kelly and their families as we head into the holiday season, please join me. 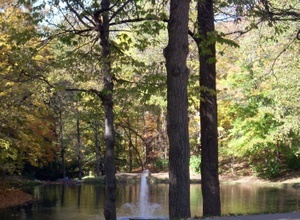 This has been the best fall weather I can ever remember. It is still incredibly nice outside, the leaves are still brilliant (the reds are drop dead gorgeous this week and against the yellows, oh, be still my heart). 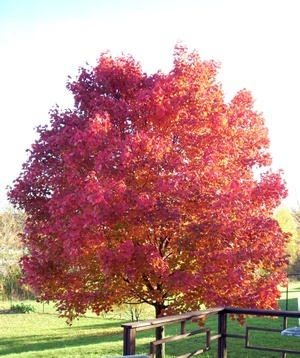 The tree pictured is our Red October Maple that sits just beyond the deck, so I had this wonderful view all afternoon while I was cooking...is life great, or what? On Wednesday afternoons I cook...it is one of my favorite times of the week actually as I cook a nice mid-week dinner for my family and make twice the amount so that I can transport the same dinner over to our priests at the rectory. Wednesday is the only day they get to dine all at the same time, so this makes it nice for them to come home to an already-made meal on Wednesdays and the three of them eat together. (Gone are the days, at least around here, when the priests all had housekeepers and cooks.) At any rate, on Wednesday afternoons I factor in the cooking for us, them, and usually one other family who needs some extra love that week by way of a meal delivered to them...sickness, new baby, death in the family, financial problems, whatever. I love taking care of people. One of my favorite parts about the whole cooking process is that I have, in my possession, many items that belonged to my great-grandmothers, grandmothers, mother, aunts, great-aunts, etc. that I enjoy using because they remind me of all my times with them as I was growing up. I know this sounds morbid, but when my Grans all passed on, the family members could ask for things to remember them by, you know, probably the same in all your families also, and no one ever wanted the simple everyday things...which was GREAT for me because those were the things that I did want...the beat up measuring spoons that I used when we cooked together, the rolling pins, the measuring cups, the mixing bowls...the recipe boxes...no one wanted them. They are my most prized possessions. So, on Wednesday afternoons (and other times of course), you can always find me in the kitchen cooking with all my memories and using all the implements that my family, some present, most gone now, used while I was growing up and learning to cook at their sides. I don't part with people easily...I like to keep them with me as long as possible, and this is just one of the ways I can do that...so, if you are in need of a meal...call me...it will give me the greatest pleasure. It's one of the things I do best! Next week I am going to make this site "Password Protected." I have thought a great deal about this, and I think that because I have so many photos and so many names, places, dates, etc. on it, that making it a protected site would be a good thing. This is NOT intended to keep anyone from reading this site as there is truly no one I would want not to be reading it, so please, if you enjoy reading the site, for whatever reasons, just send me an email and I will be happy to give you the password so that you can keep reading. I would ask that you keep the password to yourself and refer others to the site by having them also ask me for the password. When I first began this blog, it was for family and friends as a way to keep in touch and share bits and pieces of our lives with those who knew us. It is great to need only write something once instead of many separate emails! We soon became a sizable network of bloggers and it seems to be growing daily. I enjoy very much the others who have taken up the blogging ways, so I don't want to discourage anyone from reading my own. There are many of the children who like to read about Matt and Alex and they like to see their own names and photos on the blog, so it is for them that I would like to have the site protected. Thank you so much for understanding. Please, feel free to email your request of the password. I enjoy very much reading all your emails to me with comments and bits of shared info...you can never have too many friends! Goodness, Regina is Ten Already! Today at Pizza Hut for the homeschoolers Book-It monthly lunch (yes, even when I don't have a homeschooler anymore, I still attend some of my favorite functions with the people I love dearly), we all had the opportunity to sing the Birthday Song for Regina as a surprise. Humble little Regina just looked stunned as she looked around, not thinking for a moment the song was in her honor. She said, "Who's birthday is it?" We all said, "Yours!" She was so surprised that we would all sing for her...this child has the most humble of hearts and the most loving personality...and one of my favorite things about my relationship with Regina is that she loves to read, loves books, and I always, always love to hear what she is reading and what she thinks of it all. Regina is a champion speller and I can always count on her adding lots of pink to my life! Best of all, Regina, as you can see, gives the BEST hugs in the world. There is NO ONE who hugs like Regina...she hugs from the bottom of her heart, with all her soul, and by the time she finishes, you are left with tears in your eyes from the sheer joy of just knowing her and being so loved to get such a hug. She is the sweetest of souls and I can't believe she is ten already...where has that time gone so quickly? Happy Tenth, Miss Regina...you are a beautiful, beautiful soul and I am so honored to know you...each year you just grow more precious to us all. Regina: Queen of Goodness, Beauty, Humility, and Hugs! Good times this weekend, well despite the losses by the Pacers and the Colts. Those weren't so good. Alex's birthday bash for friends was all that he hoped, so he was happy. 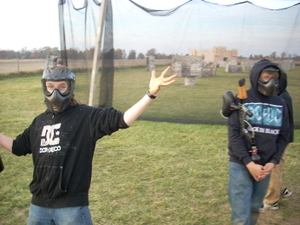 (I don't really understand this paintballing attraction, it must be one of those "guy" things.) They were there for three hours, so Mark stayed with them and I got to stroll around with Blue Bernice part of the time to enjoy the countryside as the Proving Grounds is up in Sheridan (the same Sheridan Blackhawks that downed the Guerin Eagles in football...they have the town water tower painted with footballs and "State Champs"). 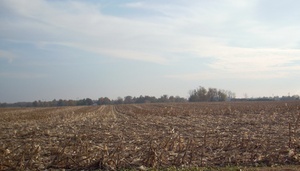 The photo is one of the fields around Sheridan, again no words to convey the tug on the heartstrings...you have to grow up with this to really appreciate it, a newly picked cornfield on an overcast November day. Instead of cake after the pizza, Matt picked out a big birthday cookie for Alex as it was something different, Alex loves cookies, and Matt thought it fit in better with Alex's cool dude image than a decorated cake. Happy to say it was a hit. The Open House at Guerin was so much fun! Five hours of just meandering about and making sure the teachers had what they needed, the kids were all doing what they were supposed to be doing, and chatting with prospective students and parents. They ran a video of the school, kids, activities, etc....you know the kind, where you feel like someone should have supplied Kleenex as it tugs so at the heartstrings. Matt was in it 9 times, so I didn't have a chance in the world of getting out of there dry-eyed...it was amazing how many of the other kids I know already after being there just short of three months. The gym was packed and everything went off nicely...Matt sang in the choir, led student guided tours of the school, and helped take it all down at the end of the evening. I tried to remind him of getting up at 4:30 a.m. for swim practice, but he didn't want to miss out on anything, so we were some of the last to leave around 9:00. When we got home Mark asked what we learned and I told him I learned that he was a "very nice guy." Everywhere I went people said to me, "I met your husband today when he was up here helping set up and he is so nice!" He just chuckled. (Actually, I didn't learn that new as I already knew he was a nice guy.) Matt has a day off school today as teachers all file their first trimester grades, etc., well despite two swim practices, he is off today, so we are going to just flitter to and fro together, landing someplace with soup and salad for lunch. Call me if you want to meet us there...otherwise, have a great day...all this sunshine is just waiting to be appreciated! Good Golly...What Have We Done??? A cheery little group gracing my countertop today. Nothing says smile like a yellow daisy! A beautifully bright sunny day here, cold, but who cares...it is gorgeous just looking at all this sunshine. Sunshine is something I can really get into anytime it's around. It's been a full day...how about there? Guerin students finished trimester finals at 11:30 this morning and had the afternoon off, so Matt figured we would help set up for the Open House together. This means I was running around like a crazy woman at Guerin with all the other crazy people trying to get the Open House all set up for this weekend. Pretty much nothing went as planned today...fortunately, they were not my plans. I got to walk the entire school, every hall, every classroom, and remove all superfluous flyers, posters, announcements, locker decorations, etc. to spiff it all up. It was actually kinda fun...just motoring about on my own, chit chatting and removing things...not bad. When I was in the library I trimmed all the plants, disposed of the dead leaves, and gave them some much needed water...something tells me the librarian isn't really into plants. They were very appreciative and looking just fine when I left. (May have to water them whenever I am up there and name them so they will feel loved individually, dontchathink?). Matt hauled around tables and rugs and various things which make all the ladies go, "Oh, my that boy is strong...." and earned him extra service hours. All in all, we were very productive, despite the glitches that arose in the original plans. Mark worked from home today as the installation for Uverse was scheduled and he figured I would never be able to answer any questions the gentleman installer would have about any sort of information he might need during the installation process (good call, Honey). He is one happy guy this evening as WE NOW HAVE THE BIG TEN NETWORK and various other things. BTN is Channel 650...I am never going to figure all this out...650??? Apparently we now have something like 1000 channels...what on earth does anyone need with that many channels? I am totally blown away...what have we done, OMW, what have we done!!! All this just so we could watch the Big Ten Games???? The parental lock goes on immediately! 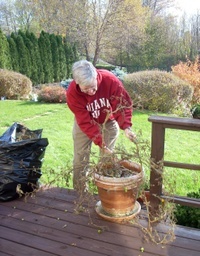 Poor Chip, as all the tomato plants were ruthlessly ripped from their moorings by Mark while he was taking a break from working on legal files, see photo left. The cafeteria is now closed. The Iowa Hawks are on tonight at 9:00...we can see what Todd and the boys are up to out there in IC...how cool is that...and, I have a date for the game...I just love date night! 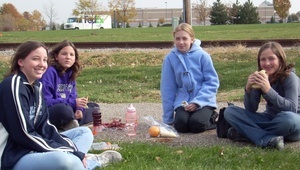 Lora, Sarah, Jenny, and Mary enjoying a PICNIC lunch outside the library today...it was 48 degrees outside! I am always telling all the girls that I need to have photos of them for my albums because otherwise there would be no PINK in my life (having all boys around here and all)...can you believe it...today they were all wearing blue! Next week, girls: PINK! LISTENING TO: Classical...Leila Josefowicz, who is performing here this weekend with the ISO...am listening now to her Shostakovich pieces (okay, for those of you who know anything about this, these were written in 1948, and yes, part of the reason I am listening to these particular selections is because Matt and I just got through that dreadful 1984 book and I was sorta thinking kindamaybe I would listen to these pieces as Shostakovich was one of those who was all bound up in that Stalin era of attempted vaporization around that time, etc. and, also, it seemed to fit my mood today)...she has plenty of other good stuff if you aren't so much inclined to listen to Russian violin angst...it is, however, very beautiful, but she will not be playing the Shostakovich pieces this weekend here in Indy, so if you want to hear any of those, you are on your own. FAV NEW FIND: Dried blueberries...made a salad twice this week of mixed lettuces, radishes, walnuts, and dried blueberries...very tasty...highly recommend it...had a lot going on: bitter, spicy, crunchy, sweet, and chewy...what more could you ask for in a salad? FAV THING TODAY: Lunch hour with Margaret...we had a really fun time laughing and catching up with bits and pieces going on. Margaret has a great sense of humor and I always laugh a lot when she's around. SCRAPBOOK PAGES THIS WEEK; Just sorted through photos this week and lined them up with day planner entries for journaling. Thanks to Bob I have several really good professional ones of the fall concert at Guerin of Matt singing in the choir...what a deal, you just tell him what you want, he shoots it, and you order online. Easy...he has several good ones of Colin and his cello, Aimee, so head on over there and order a couple! 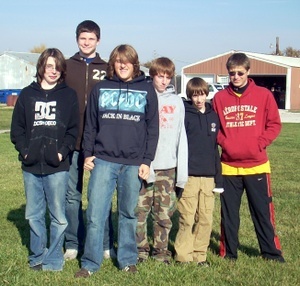 GOING TO: Celebrate Alex's birthday this weekend as he will be at a scout campout next weekend, the actual day of his birthday being November 17th. 15 and can't wait to be 21! Alex at 21...I can't even imagine that yet. He's taking a few friends paintballing on Saturday afternoon, to be followed by pizza and the traditional cake eating bit. Pacer game Saturday night, wonderful seats! Church, music, Guerin Open House that we will all be attending and working towards all weekend, football, basketball, and swimming round it out and it will be Monday before we know it. PRAYING FOR: Jeff Anderson's sister, Michelle, who is 43 with 3 young children and has just been diagnosed with Parkinson's Disease, as she struggles with the diagnosis and moving forward with it in her life. Also, for Jeff's family as his 92 year old grandmother is nearing the end of her life and is suffering greatly. For my friend, Carolyn, who is undergoing surgery for cancer and treatments following, and for her husband, Paul, and the children Lydia, Frances, and Charles as they battle forth with her. For all patients suffering from PD and Cancer...please join me. 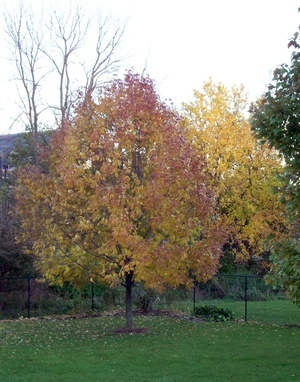 Figured I should include a fall photo of our little Ash tree while I still have the opportunity. The others around us have been stricken with the dreaded little bugs and I am afraid that it is just a matter of time until we will have to say goodbye to ours, too. For now, she looks fine and very pretty on this overcast day. Important to appreciate these things while you can. It was a beautiful morning here with bright sunny skies, etc., but now it seems to be changing a bit...I can hear the wind starting to howl down the chimney a little, the skies are clouding over, the temperature seems to be dropping, and I am ushering in the rest of my herb pots hoping that I can salvage enough yet for the season to last through the holidays. There is word of snow flurrying about this evening...definitely not ready for that yet. Mark's new redo of the network situation (and I still don't understand what it completely involves, other than I know it will allow us to watch the Big Ten games here in our family room instead of hiking up to Majors Sports Pub to watch them there, a big plus in my mind, winter being what it is and all) is set for Friday and he informs me that I "will be able to tape TV shows like one would with TiVo" (which is probably some sort of cousin to Blu-Ray...just kidding around). This, I am thinking is not a particular selling point to me as I don't have any "shows" to tape. I am not much into the TV watching world that I would have a regular type show to tape, etc. HOWEVER, I am thinking today that maybe I do have a show...or I will have if I can figure out how to tape it. And, this will come as no surprise to anyone who knows me well...I can TAPE THE MARTHA STEWART SHOW and watch it. Okay, now I have a show! Now all the teasing about me being a "Martha Wanna Be" (minus the crafts, of course, as I am not particularly good at most of those, but who knows...I have more free time now, who knows where this could take me in the future) can be stepped up even more. BTW, today on her website, her tip for the day was to go to the orchard and pick apples and make a pie, etc., so I am feeling really good because I did that yesterday! Okay, I didn't actually pick the apples as the orchard already had nicely bagged apples right there waiting for me...but the apples did come straight from Stuckey's Orchard and since Mark was such a sweetie and picked up Matt from swimming after work so that I could have a shift relief and not have to fight through rush hour traffic, and it is important to reward such sweetness with something sweet to show you really really appreciate these kinds of gestures, I did make him his favorite pie with said apples, and now I am thinking that maybe Martha is copying ideas from me to use on her website the next day. Okay, silliness aside, I am thinking that I will need to figure out this TiVo-type deal so that I can tape Martha and finally be able to say, "Of course, I do...I have a show that I tape and watch!" And, as Martha would say, "It's a Good Thing!" Another view of my favorite Still Waters place at Butler...Matt and I arrived a little early, so we sat here and he spent 20 minutes trying to walk me through leaving a message on my cell phone...after 20 minutes, he said, "Give me the phone, Mom." The message on it is the result. I know you will all be amused at my expense. Maybe next weekend. A weekend of The Good, The Bad, and The Ugly. The Good, of course, were wins on the field by Carmel at sectionals, and IU Football (vs. Ball State). The Bad, although it ended Good, were the Iowa Hawks who took forever and day to rally for a win after a really bad start...have we just given up on post season football bids there in IC or what? And, the truly ugly was the tortuous game Friday night where Guerin went down to the Sheridan Blackhawks 48-7, followed closely by the Colts' loss to the Patriots today. The best of all, however, was today as the IU Hoos played an exhibition basketball game...and what's not to love about winning 121-76 against North Alabama...exhibition games being our chance to see a bit of the Good, the Bad, and the Ugly coming up during hoop season this year. A lot of it looked good...especially the looking fairly quick bit, D.J. White being able to play both ends, and Crawford's three point shooting spree. The bad really only being the injury list at this point. The ugly being, well we won't discuss that here as Mark just goes off on a tangent about the little mess down there with recruiting violations as he has no patience (and why should he?) with things like that...it's not like Sampson is not familiar with the problem...yikes...losing a scholarship, etc. isn't sitting very well here in Hooville. 9th in the country? Hmmm...well, it's early yet, maybe, maybe not, and we take whatever they want to give us at this point, right? It's a start! (Which is more than we can say for that sad exhibition BB game the Hawks put together Thursday night...although they did win...we will give them that.) I think we have to wait until Saturday to check out the Red Raiders and get a look at Bob's team this year...we know Zeno is looking good with his honorable mention in the pre-season Wooden Award Top 50 Candidates List...now if we just got TTTN. In other Good, Bad, and Ugly news: IYC concert was really good; the swim times were fairly good, a bad one here and there, but it is early in an aging up year, so our expectations are a bit different at this juncture; the weather was absolutely gorgeous all weekend; and the tomato vines were granted a week's stay for Chip, good deal! This weekend went way too fast. How about there? My Little Buddy Chip (click on photo to enlarge). We have generously shared our tomato bounty with this little guy all summer long, mostly because he is very hard to catch, but caught him I did today...with the camera that is! (And that is the only way I want to catch him, btw.) I was at the kitchen sink looking out the window and thinking, "Hmmm...who left what on the deck railing..." when it moved! He reached right up, grabbed one of the remaining little yellow pear tomatoes and started snacking away at it...how cute! I grabbed my camera and aimed the lens out the door window figuring he would scamper away, but he didn't...he probably figured this might be his last raid of ripe tomatoes for the season (and he would be right as Mark informs me that those plants are being ripped out this weekend, despite my pleas of granting them a stay). 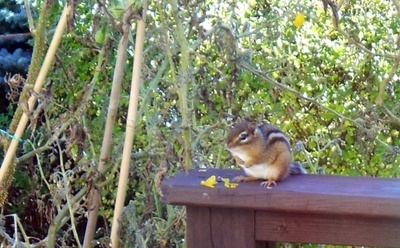 All summer this little guy, who I have named Chip, of course, and I have agreed that he can have his share as we had plenty, and I would watch him come and go as I went about my kitchen routines. Maybe Mark will grant one more week of a stay...or until Thanksgiving, it certainly seems right that we can wait until Thanksgiving weekend just in case Chip develops a taste for the little green tomatoes still clinging on the vines. Then, I know, all good things must come to an end, and Chip will need to figure out Plan B for his dining pleasures until next tomato season. It is absolutely gloriously beautiful today here...the sky, the autumnal trees in vivid bloom, the grass is still green...and I am off to enjoy it all as I go from thing to thing today...have a great weekend...I can't wait to hear all about it! 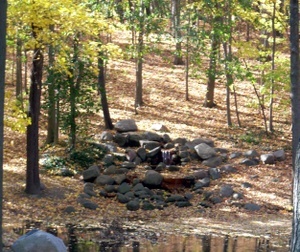 A fall shot of my favorite Still Waters place at Butler University where I can wait for Matt while he is in choir rehearsal...about the end of it this year as it is getting cold! COOKING THROUGH: Soups and stews...everyone on the go every night, so it has been "Scoop and Scoot" all week. SCRAPBOOK PAGES THIS WEEK; Four. GOING TO: Guerin football game vs. Sheridan (one of the football powers in the state, so our little surprise of winning two games already in sectionals is probably going to come to a halt, but we will cheer mightily anyway for the possibility of a sectional final win Friday night); swim meet on Sat. and Sun., IYC concert in Ft. Wayne (2-1/2 hours away) on Saturday afternoon which means we swim all morning at the meet, drive up to Ft. Wayne still wet, rehearse a bit, have a 4:00 performance, and then head back to Indy where we get up again at 5:30 a.m. to swim in the meet on Sunday morning and have IYC singing in the afternoon, followed by LifeTeen. "I think we can, I think we can, I think we can...." said the Little Engine! No moss growing under our feet...how about there?